God Of War Red is our newest pre-training supplement and is the stronger version of God of War Black. Consisting of multiple powerhouse ingredients plus additional stimulants, God of War Red provides maximum pump, focus, and endurance during any type of training. 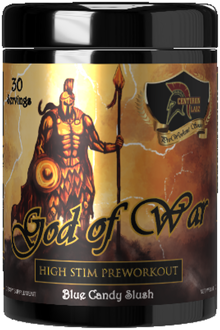 Featuring the same or similar clinically studied doses of our main ingredients, a harder-hitting stimulant blend, and essential vitamins and minerals for maximum absorption, God of War Red is for anyone who was previously 2-scooping God of War Black or needs an extra kick to get to the gym. Creatine Monohydrate - This ingredient is naturally occurring in meat and fish. We utilize creatine monohydrate to help volumize the muscle during weight training. It will also create a friendly environment in the muscle to recover better from training. Creatine does this by aiding in shuttling water and nutrients into the muscle allowing it to recover at a more rapid rate. Beta Alanine - Is a non-essential amino acid utilized to metabolize lactic acid build up in the muscle during weight training or other vigorous exercise. Metabolizing lactic acid will create an environment in the muscle where it is able to work harder, for a longer period of time before fatigue allowing our customer to smash through plateaus! Arginine AAKG - Is essential to trigger nitric oxide production in the body. This ingredient will aid in vaso dilation enabling your body to shuttle more oxygen and nutrients through the blood into the muscle. This effect will increase endurance, as well as aid in the elimination of ammonia build up during training. Theobromine - This is an alkaloid belonging to the methylxanthines. The structure of theobromine is similar to that of caffeine. Theobromine will not stimulate the central nervous system but what it will do is dilate the bronchi vessels as well as enhance vasodilation for an enhance pumps. Theobromine will also create a very euphoric workout. Amp citrate - This ingredient can be found in Pouchong tea, a Chinese tea similar to oolong. This ingredient is utilized to stimulate the central nervous system. This will enhance focus, energy, and metabolism creating an endorphin rush during training. Caffeine Anhydrous - Caffeine is a chemical found in coffee, tea, cola, guarana, mate, and other products. We have used it to improve mental alertness, but we also utilize it to enhance metabolic rate, as well an increase overall energy and well being. Mucuna Pruriens - This ingredient is utilized to reduce a hormone called Prolactin in the brain, which causes anxiety. This will create a fantastic feel good effect sustained well after your workout. The second edition is even better than the first. God of War Red: Prepare for War... again!